I hope this finds you doing well and if you aren't doing well, I hope you're at least fair to piddling. That's spose to be fair to middling, which means slightly above average. My middle school friend's mother always said fair to piddling and we would burst into giggles. That reminds me of my Aunt Alzada. I think I might have told you this before. We would write letters over the years and one time she wrote, "Well, after all, he has a hard roll to hold." The expression is "a hard row to hoe," but that's not the way my Aunt heard it all her life. I loved her way of saying it! Makes me wonder what old idioms I have misheard and misuse! The star of the show (you'll pardon the pun) is the galaxy-ish alcoholic Yupo paper in shades of blues and purples peeking out through the stars of my NBUS stitched Star Panel die from Your Next Stamp. The sediment is from an old PTI set called "Glory Be," and it's heat-embossed in purple e/p, as is the schprinkling of stars. I'm going to use this card as a birthday card with a sassy, "You're HOW old?" on the inside! Mix It Up: Anything goes, plus option of rubberband stamping. Moving Along With the Times: Add a sentiment to your card/project. Your Next Stamp: Fun Friday: Die cuts. For my second design, I took the stars that fell out of the die cut in my first design, colored them for Hammy to glossify, and arranged them as a rainbow galaxy. The moon is one of my favorite old wooden stamps, unmarked. Of course, he had to be glossied up, too! The encouraging sediment is from Dylusions Quintessential Quotes. I inset the front panel in order to show you a bit of the lavender base petticoat on both sides. 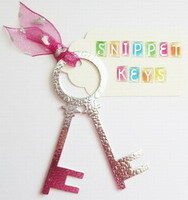 I am sending this to a young woman bravely fighting cancer for the second time. How will you play with your STAR stamp, stencil, or die to make two different cards for two different occasions? I can't wait to see!! Please check out the Twofer Card Challenge blog for all the details and to see the fantastic double designs created by the talented Design Team and our two amazing Guest Designers this month: Barb and Cat! Thank you! And if you're still here, I'd love it if you could send prayers and positive thoughts for the Mister. He has a back condition that has always made his back a bit dicey. The last time it went out, the doc said it was just a matter of time before he would need to have surgery. He has been diligently doing exercises every morning for three years to help keep the area stable, which it has done. Then suddenly it wasn't enough and he's been flat on his back for two days. Hopefully he will be able to get in to see the doctor early this week and get the surgery scheduled. Thank you! If it ain't one thing, ... 🙈! And, as always, thank you for coming by to visit the Playhouse and special thanks to you if you take the time to join as a follower! Please let me know you came by so I can be sure and return the flavor! Gorgeous cards Darnell. Hope Mr Darnell gets his surgery arranged quickly and is soon up and about and getting under your feet again! Praying dear Darnell for Mister.. poor dear man... that surgery will be pronto and well done efficacious in other words. Brilliant twofer. I'm a tad lazy at mo hope to join but see how I go.. need Christmas cards so could try!! Two wonderful cards Darnell, I shall have to go and put my thinking cap on. Both look so fresh and vibrant and stood out on my blogrol! And a super moon-image! Love it how you used the diecut stars so differt! Enjoy the sunday. Fabulous cards Darnell - I love the vibrant colours of the stars in the second card and a beautiful sentiment too. I hope Mister's back improves quickly after his surgery. Hello Darnell, sorry to hear of your Husband's back pain, I hope the pain eases soon. Just said a prayer for the Mr.
Back pain is no fun and neither is surgery. I've also said a prayer for the women who is battling cancer yet again. 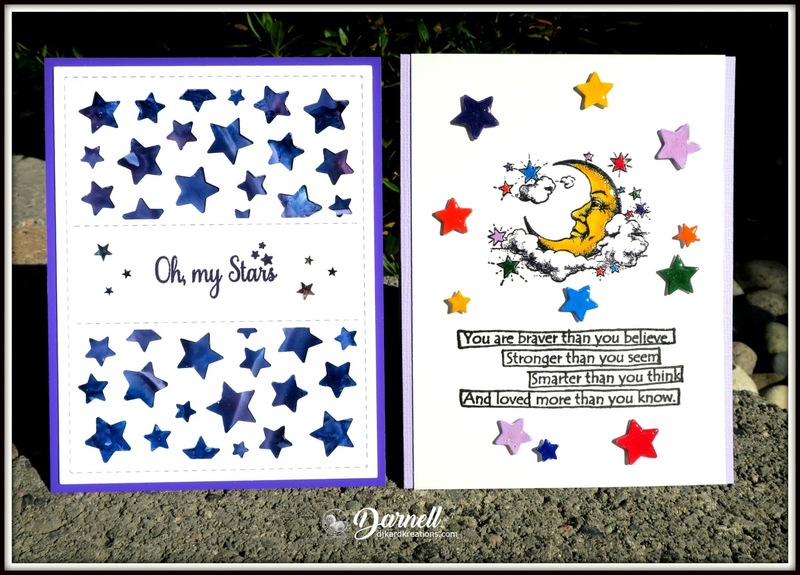 Wonderfully pretty starry cards, Darnell. You also had me giggling at the idioms. So true, so true! I do hope the Mister can get relief from his back issues. Surgery isn't a joke, but if it helps, the short term extra pain may be worth it. Will keep you both in my thoughts, as this isn't an easy road for you either. Hugs! Love these cards, Darnell. I'm praying for Mister and that everything goes quickly for the surgery and he has a smooth recovery. Under your watchful eye, I'm sure he will be back to his normal before long. Enjoy your day! You are such a star! This first one is so pretty and uplifting for the second one. I love the sentiment for the inside of the first card. Oh no, I'm so sorry to hear the mister is down. I hope he gets in and gets his surgery scheduled soon and it can be micro surgery. Put your nurse's hat on and get ready to help him in his recovery. Hopefully strides have been made in the last three years that will keep him from having surgery. Prayers coming your way. Keep us updated. Two really beautiful cards, Darnell! I love how you used the positive and negative versions of this die for your 'Twofer', and your color palette on your alcohol inked panel is perfect for the sky! LOVE your sentiments, too...WOW! What a great challenge to use stars and I already have ideas floating around in my head! 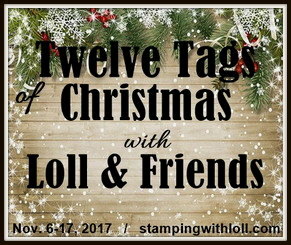 Love your 2 cards too...love the Al ink behind your die cut stars in the 1st card and great idea to make rainbow colored and glossified stars with the leftovers of your 1st card to go on your 2nd card! Love that sentiment on the 2nd card too...perfect!! And I'm sorry to hear about the Mister's back and will definitely keep him in my prayers!! Take care my friend. Hugs. Are you wearing your galoshes? Hope you are staying dry. It could be worse look at Seattle and Portland. I love the die in card #1, and the sentiment in card #2. Sorry about Kevin. My sister struggled with back pain and now son #2 was diagnosed with rheumatory arthritis (sp. ?). In my opinion back pain is one of the worse things to suffer with and hopefully surgery will help Kevin. Hugs to you all. Such a gorgeous example of twofers! Love each of these and especially how you used the cut out stars!! Just got home after two days of being forced out because we lost power. Gotta love Michigan in winter! Thank goodness our son only lost power for 12 hours. We were able to stay with them. Hi Darnell, Cards are great. Sending heaps of positive healing thoughts to your hubby. Hope he can get the surgery quickly. Totally sympathise as I have Arthritis and amongst other places my two lower vertabrea are affected and move trapping the Sciatic nerve. Oh, these are two FABULOUS cards, Darnell! Love them! And I'll be thinking of you and your husband...hopefully he'll get some relief soon. Putting my hands together in prayer for the Mister. Hoping he'll get the relief he needs real soon. Praying for you, too, as one care giver to another. Admiring your star creations, greatly. Think the sentiment on the first one is hilarious and the second one might pertain to you and the Mister right about now. Two fabulous cards Darnell! I can see why that moon stamp is one of your faves...it's awesome! Sending appropriate hugs to the Mister with heart felt wishes for healing soon. This was such a tough one for me - and I see all these fabulous cards and wonder why. I love that alcohol panel behind your die cut star panel and it is gorgeous against the white. Quite perfect in fact. Then using the extras and making them into cute little embellies was smart. Fabulous twofers Darnell. Thank you for the wonderful Valentine, and as I was looking at it I thought that flower was familiar...then I opened the card. Thanks sweet friend. The stars challenge will be a challenge! Thanks! Yes, prayers are going up for your DH and for you. May things progress rapidly. I know you will be and are a great caregiver as he heals. Hugs, dear Darnell. Oh my stars, the galaxy yupo background is stunning and shows off the stars magnificiently! Your sencond card is beautiful, Hammy did a wonderful job, as always, with his glossifying! Two really beautiful cards. So sorry to hear that Mister has again back issues, I wish him a speedy recovery after his surgery!! Your cards are both fabulous and make me smile!! Amazing twofer, love especially the second one with that fabulous moon and the great quote! Two really wonderful cards, some really lovely elements used on both cards and fabulous colours. Love the sentiment on the second card. So very sorry to hear about the Mister, will say a little pray for him and I hope that things move very quickly. 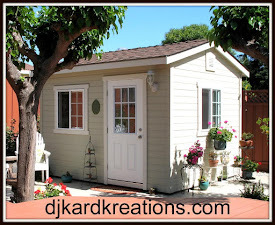 Hello… Thanks for sharing your lovely project with ‘Moving Along with the Times Challenge Blog’; it fits perfectly with our ‘Add a Sentiment’ challenge theme. Hope you can join us for our next challenge. Now that's the way to use your stars! What a great twofer -- one CAS with a pretty alcoholic background, and the other all colorful with such a cool stamp. Love the gloss. The sentiment is ideal for your friend. I'm so sorry for the Mister. Surgery can work wonders so I hope he gets scheduled soon. Hugs. Your alcohol inked background shines beautifully through the starry panel! That is a fantastic idea for a birthday card, Darnell! Your glossy rainbow of stars sparkle with their friend, Mr. 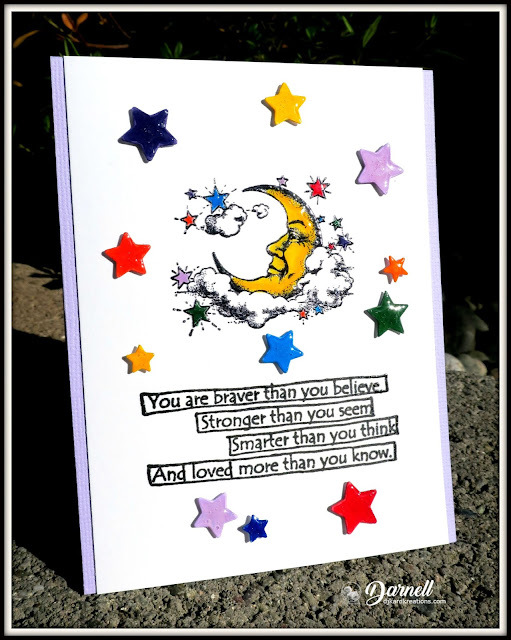 Moon and make your encouragement card extra special. I will pray especially that Mr. Mister can get in to see the doctor and that the process toward full relief moves quickly! Oh my stars indeed! Love this die with the cut out stars so your gorgeous Yupo can shine through! You've made good use of those stars on the twofer! Love that sentiment and think it's so appropriate for someone fighting cancer or just for someone who needs a lift for any reason! Will send out prayers for the Mister. I hope he can get some relief soon. I love your cards, and I really do want to join in the latest twofer challenge. Hmmmm...I need to pull out my starry stamps and dies and see what I can come up with. Hope you have a good week. We're digging out from mounds of snow here in Minnesota--with more to come tomorrow night according to the weather forecasters! 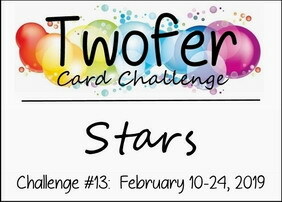 Wonderful cards and wonderful theme for the Twofer this month - I love stars! The blues and purples in the first one are glorious - such great colours! And the second card is so much fun with the man in the moon reclining on the clouds. You have far more patience than I to colour those stars for hammy to glossify! Poor Mister!! I really hope it heals up soon. As someone who has had a seriously dodgy back for several years, I can highly recommend Pilates. I've been taking a class once a week since October and hand on heart, it has been the best thing I've ever done. It has saved me from pain, from being doubled over and has strengthened muscles I didn't know I had. I get out of bed of a morning without scrunching up my face to cope with the pain. Even if he does need surgery, I would totally recommend it for follow on care. It's been revolutionary and I am now a zealot! Hugs! 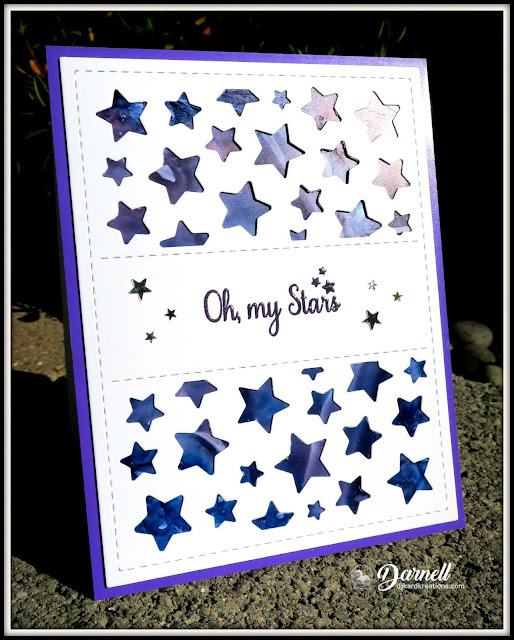 Gorgeous starry cards Darnell .... the alcohol ink background behind those stars looks fab and I love how you've used the left overs for the second design. LOVE both of your star cards Darnell. Super colours on the first and the sentiment on the second is so inspiring. I just finished making a star card so will have to make another before it all gets pur back in the cupboard.... so hopefully will be joining in this month! What a great twofer prompt with the stars! Love those glossy little stars and the pretty yuppo stars as well! Two great cards! I do hope the Mr finds some help this week to ease his pain and get things back on track. Hopefully by now he's found something to help with that terrible pain. Sending healing hugs for both of you. Dear Darnell - I totally adore both these cards, so perfect for each recipient. My fave has to be the second one as that sentiment is so inspiring. You used the stars just beautifully. Sending positive thoughts for the Mister - he has my utmost sympathy and I do so hope there will be a solution in the near future. My guess is that every trip to the bathroom is a 15 minute excursion - Len timed me through the night! Hope you have your nurses outfit on?! Do give Kevin a cuddle on Dudley's behalf as well please. Now that is just too clever to use those die cut stars for the second card! Fabulous Twofer! Sending healing thoughts to you Mister. I hope he gets his back fixed well and soon! I love to make cards with a purpose and your two lovelies definitely have that, Darnell. One to tease an aging friend and one to uplift another. Saying prayers for your "Mister"
Oh Darnell! Love these cards. What a great twofer challenge! I'm praying for you & your husband. Just discovered I have 10 herniated discs from the neck down. I feel his pain! Hope he can get the surgery soon and I pray it will be successful. Two beautiful cards, Darnell! So sorry to hear your husband is not well. I will be sending healing thoughts! Darling star cards, Darnell - just love the design on both!! Awww - so sorry for your poor DH!! My neighbor had back surgery last year and has had great success - not that anyone wants it to get to that point! Anyway, hope he's feeling better every day!! Super cards Darnell, both of them. The first one is glorious and sassy with the alcohol inked yuppo background. The design and the sentiments on the second one is so thoughtful and beautiful x. Thoughts and prayers too to your very brave young friend x. 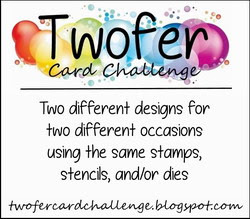 Fun twofer challenge and thank you for the wonderful inspiration x.
O, it's Twofer time again! :-) Your cards are amazing. I like the blue background on the first one and the inspired sentiment on the second one. Silvo and me are sending best wishes to the Mister. Two totally different, equally awesome cards! Oh my stars, indeed. And wishing your Mister the best - husbands in back pain are not fun for anyone. Your second card is very cool. Love the moon image and great idea to use the leftover stars to colour up into rainbow colours. Great sentiment of encourage to send to Dina. Two star studded delights Darnell! A birthday treat and an uplifting bit of happy mail. So sorry to hear about the mister, poor guy. You've got those requested prayers. Love seeing all those stars on your two fab cards, Darnell! So sorry to read about your husband's back problems...Sending prayers for a non-surgical solution! Two wonderful cards and you are the STAR in making them! Love these cards Darnell so pretty and the moon image is terrific! I'm so sorry about the Mister... I know how that feels! I do hope he recovers soon... I had the surgery and I'm like a new woman so tell him not to worry too much...you either! WOW, these cards are fantastic, Darnell! - The alcohol inked background of your first card shines beautifully through the die cut panel and the glossy stars on your second one are real eye-catchers! - What a clever idea to use the die cut stars from your first card!! Healing wishes to your Mister. I hope he will recover soon!